While life at sea is a huge draw for man, unfortunately not everyone has the funds of a superyacht owner - which is why large numbers of men and women join the US Navy each year. While this is often arduous work, spending months deployed around the world protecting international waters, recruits are allowed some well-deserved downtime during 'swim calls'. The tradition dates back to WW2 and usually sees officers leaping from the heights of their battleships, swimming in the waters below and relaxing on the stern landing docks. 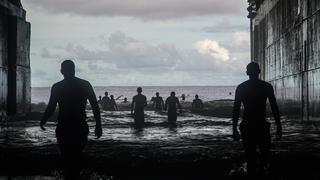 Click through to see some of the coolest pictures from swim calls around the world. 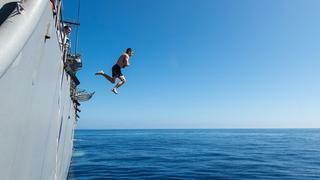 Logistics Specialist 3rd Class Zachary Thompson leaps from the deck of guided-missile cruiser USS Mobile Bay in the western Pacific Ocean. 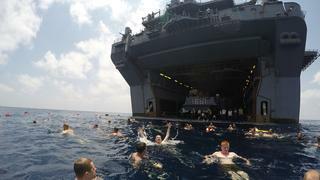 Sailors and marines from the amphibious assault ship USS Iwo Jima take part in a swim call in the Gulf of Aden in the Arabian Sea. 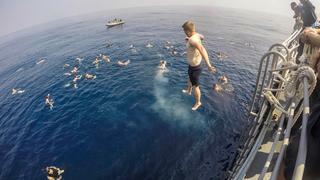 Sailors on board the USS Peleliu jump off the ship's lowered port-side aircraft elevator in the western Pacific. 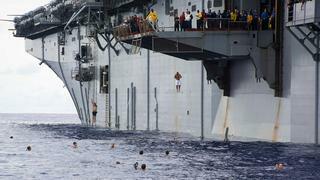 Sailors exit the amphibious assault ship USS Peleliu through the stern gate during a swim call after successfully completing a Rim of the Pacific Exercise in 2014. 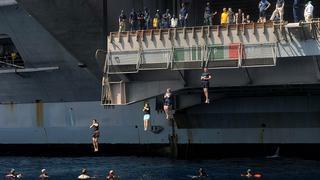 Sailors from aircraft carrier USS Dwight D. Eisenhower jump from an aircraft elevator during a swim call in the North Arabian Sea. 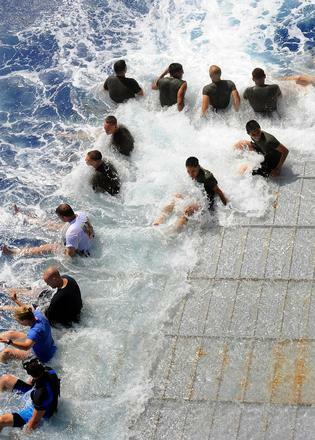 Sailors and marines let the waves wash over them as they sit on the stern gate of the amphibious dock landing ship USS Fort McHenry during a swim call in the Mediterranean Sea.